In October 2016 we became proud parents of our daughter Mayla. Before she came into our lives we had visited many places; India, Singapore, Bali, Thailand and several states in the US. This last country is our favorite destination. Therefore, when Mayla was only 7 months old we spent our holiday in the US. 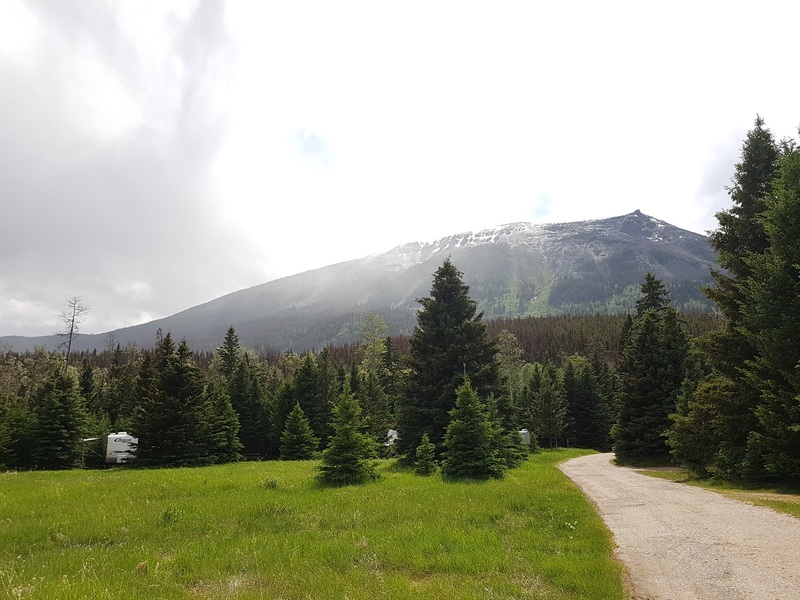 We also had a camper trip through Canada on our wish list, so we decided to go to West-Canada in June 2018. Mayla is 1,5 years old now and we’re sure we can handle a camper trip. The special thing about this trip is my parents are coming along (with their own camper of course). Not because we don’t want to travel by ourselves as a family but because we want to share this experience with the whole family. And lastly because my father has dropped multiple hints these past years that he would love to take such a trip with us. A camper trip through West-Canada is easily done with a (near) toddler. There is lots of nature and Mayla can play outside on all the camp grounds and campsites we visit. The trails we walk are easily done by her too. We always take a carrier with us for when she gets tired and sometimes she tells us she wants to get into ‘the bag’ when we are still at the camper. We really enjoyed travelling by camper. It’s good to have everything you need within reach. Camper trip through West-Canada with a toddler, what can't you miss? Unfortunately, on Vancouver Island Mayla is not allowed on the boat to spot whales or killer whales. Children under 2 years of age are not allowed on an open boat. We knew this, so while my parents do this we are visiting Elk Falls. 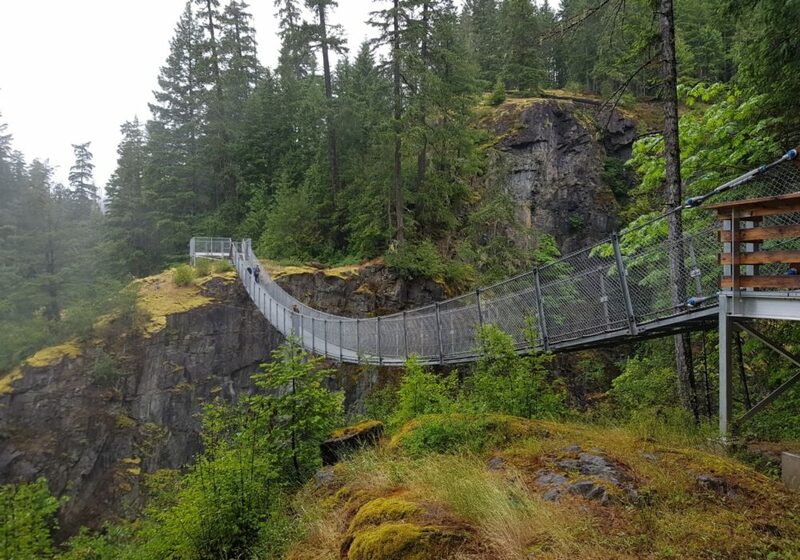 A beautiful waterfall in the middle of the forest with a suspension bridge. It’s a rather popular attraction and very beautiful. Mayla falls asleep in the camper on our way there and she is in such a deep sleep she doesn’t even notice us putting on her coat and putting her in the carrier. Only when we get back from our hike does she wake up (and I secretly enjoyed this hike because of this as there’s nothing like having your daughter sleep close to you). Are you spending more days in Vancouver? Check out this 4 day Vancouver itinerary. 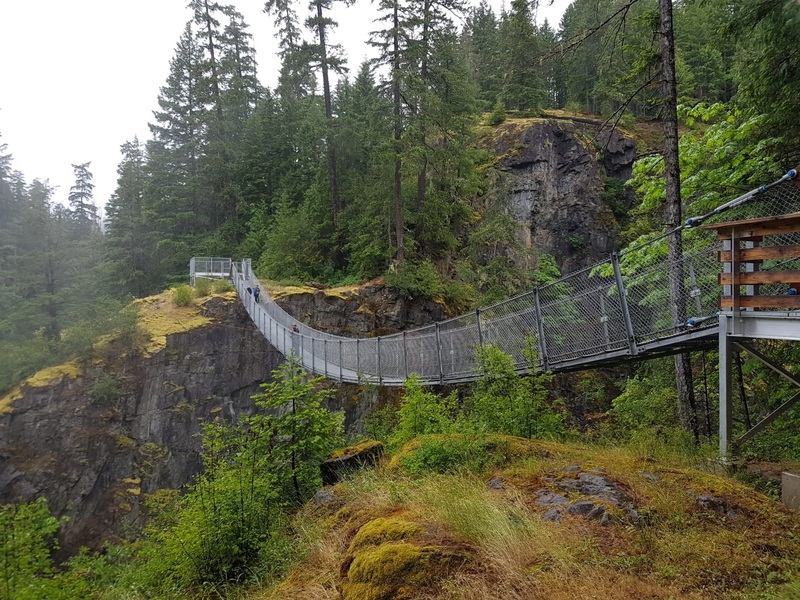 A skylift that takes you to a beautiful view on a mountain near Whistler. Such a stunning view and a real experience walking up there. On our way up we spotted a bold eagle in the forest (beautiful animal!). On top of the mountain there is a restaurant and you can walk over a suspension bridge to another top where the view is just as beautiful. I’m a real hero as I walk Mayla in the buggy over the hanging bridge. One of the highlights in Vancouver. 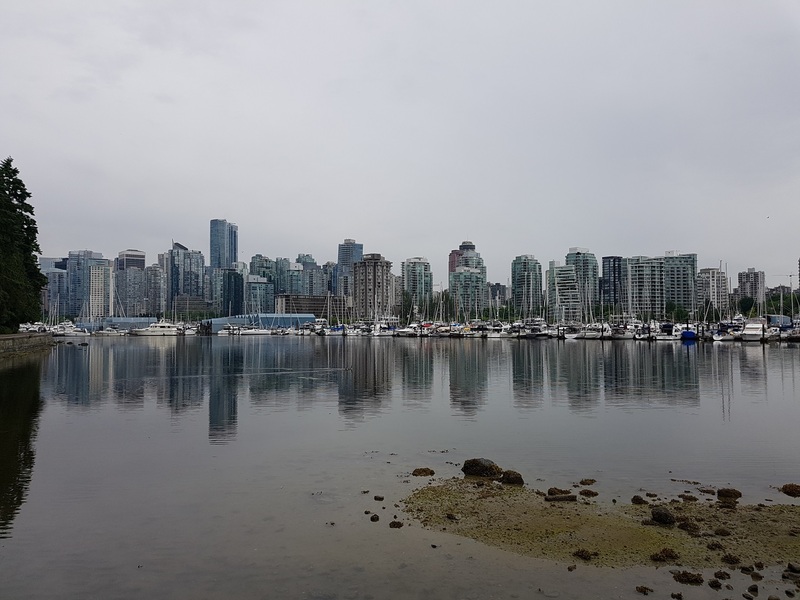 For the first two days of our camper trip through West-Canada we stay in a hotel on Robson street, from where you can go for a lovely walk to Stanley Park. This is a beautiful park with a beautiful skyline of Vancouver. Aside from this, it’s a lovely place to go cycling, walking or running. Mayla loves it too; she can run around and play in all the little playgrounds we visit on the way. One of the most beautiful campgrounds we stay at with the camper! 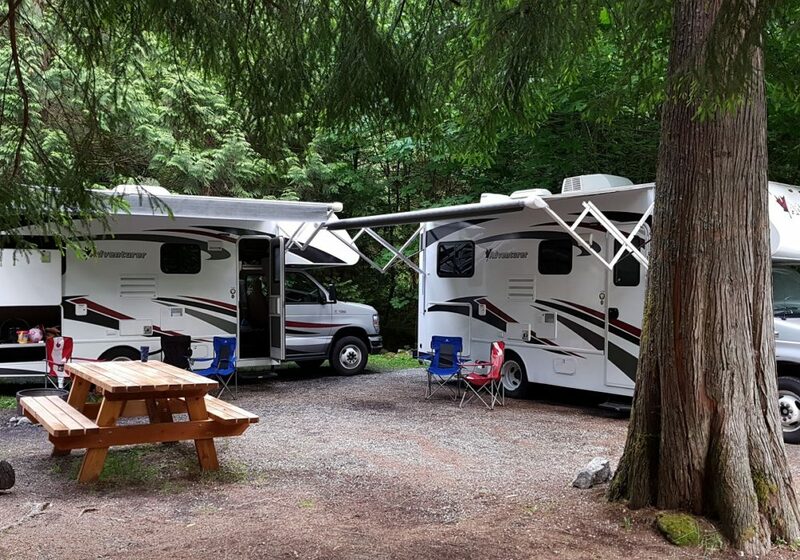 Unfortunately the campsite is rather popular and all the full hook-up spots are taken. We are set on a spot with no electricity and water and we rather enjoy it. The peaceful feeling you get, even though the place is rather large, is very nice and the spots are well kept. In a centrally located building you can shower and next to this building there is a large playground with a playfield. The parents get to enjoy a beautiful view. On the campsite elks walk around with their young and I think that’s rather special. So this is truly recommended when you make a camper trip trough West-Canada. 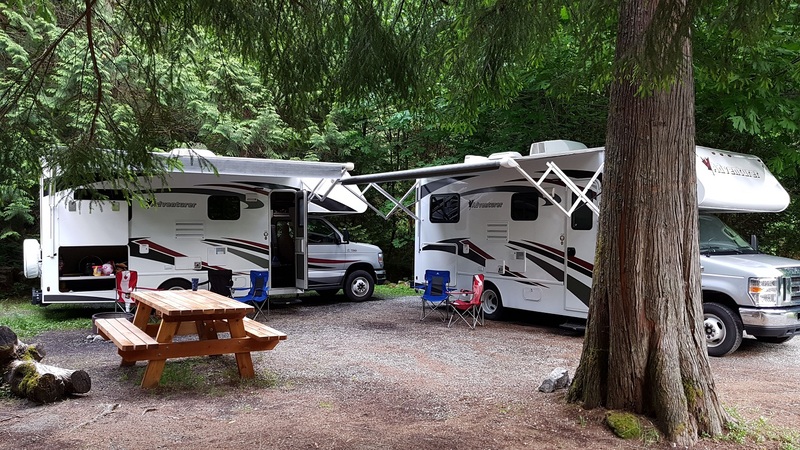 We arrive at this campsite because we would really like to visit Wells Grey National Park. Such a beautiful campsite in a beautiful location. This campsite lies at “Dutch Lake”. The waterside is littered with white and pink lilies. Wells Grey is absolutely worth paying a visit. The Helmcken Falls are very beautiful. The only downside we noticed is being an absolute prey to mosquito’s. Luckily, with enough spray and clothing we could manage. Canada is well known for bears. Before we leave for Canada several people tell us the best chances we have to see bears is at Icefield Parkway. As it turns out this is a spot where we see lots of Elks but no bears whatsoever! Just before and after Icefield Parkway though, we spot a grizzly bear and two black bears. One bear was relaxing, enjoying his lunch on a parking spot. We drive past carefully to take a closer look. Mayla spots the bear from the backseat and barks at it enthusiastic. After 15 attempts of us to try and explain to her that it’s no dog we give up. 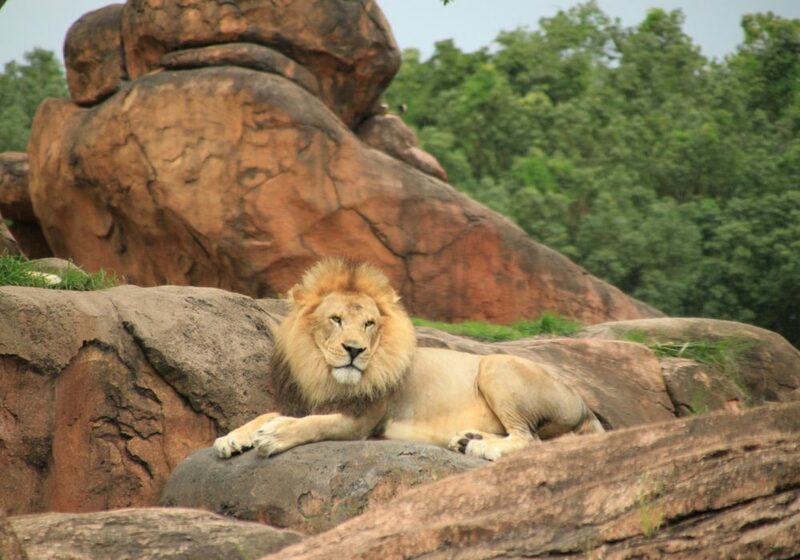 Wonderful animals to spot in the wild, very impressive! When you drive over Icefield Parkway (the drive itself is amazing) you should really visit the well-known surrounding lakes. We didn’t get to see Lake Moraine unfortunately. When we arrived there (at 8:00 in the morning) the parking lot was full and so it was at our second attempt. 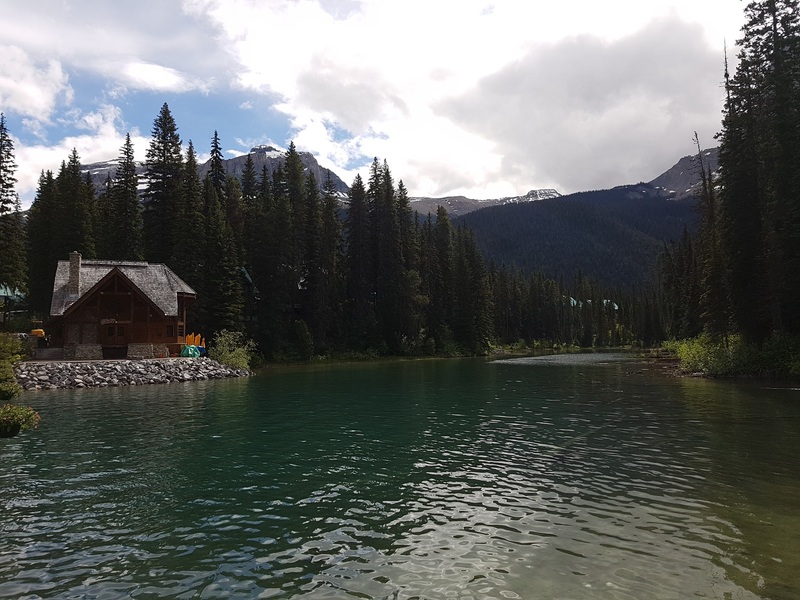 Eventually we visited three other lakes; Louise, Peyto and Emerald. Our favorite is Peyto Lake. What a beautiful lake this is! I’ve never seen anything like it. After a short climb where Mayla treats everyone to a large smile from daddy’s shoulders we reach the lake. It’s a less touristy lake so you have enough time and space to explore the surroundings and take everything in. 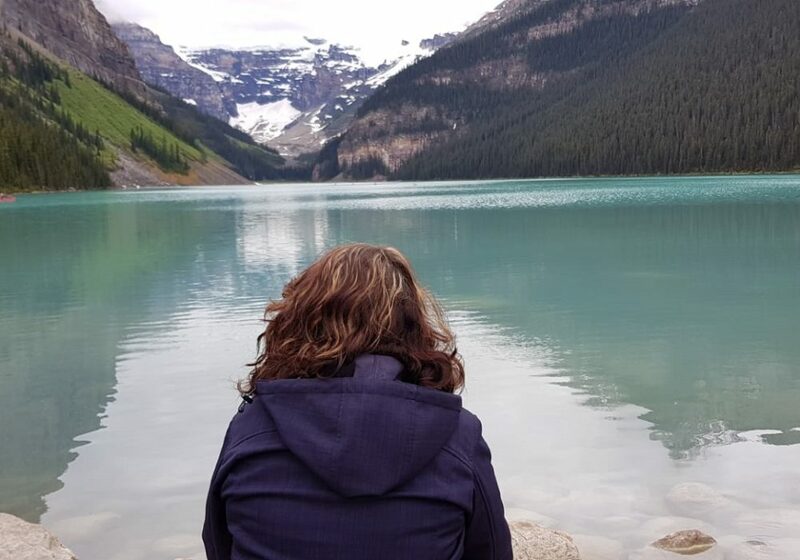 We love Lake Louise too and the best part is that you can walk around it. This lake is very touristy and we need to be careful Mayla doesn’t get squashed. 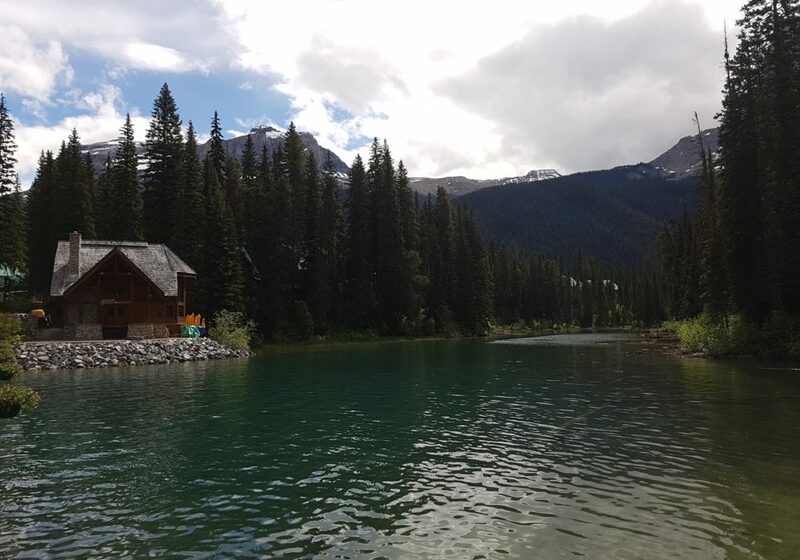 Emerald Lake is a real beauty too. This trip is very special to us. It’s our first camper trip and we enjoyed to travel this way. That we got to experience this trip with my parents even made it more special. We would sit at a camp fire every night while Mayla was sleeping. Lovely to be outdoors this much. Would you like to know more about our travels? Take a look at our instagram page: M3travels. We often posts beautiful pictures of our travels here. 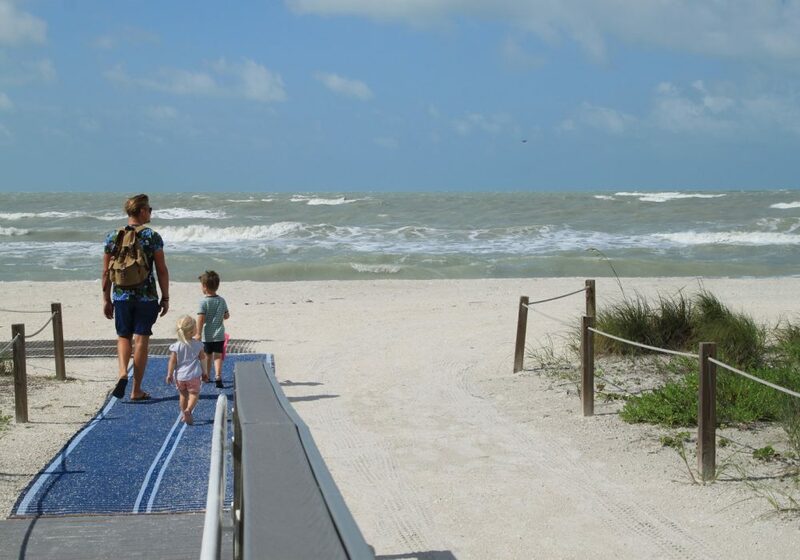 ​Camper holiday in Florida: Sanibel Island is da bomb! 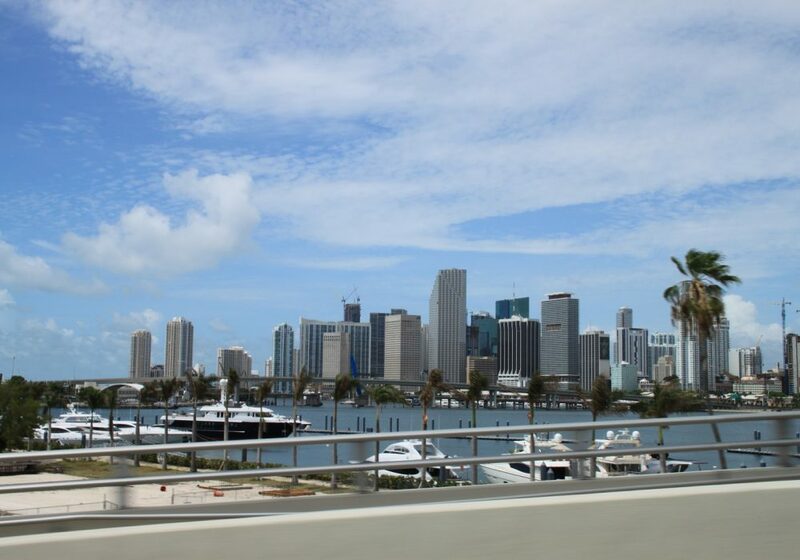 Camper trip through Florida: welcome to Miami!